Anglers and walkers have been warned not to touch sick or injured bats after details emerged of a bat with rabies. The case, which was discovered in Radcliffe, Gtr Manchester, is due to be discussed at a conference on Wednesday discussing animal to human infections. 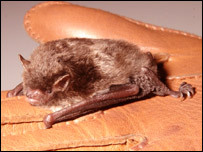 Four people had to be vaccinated after handling a Daubenton's bat found on a canal towpath in October 2003. The Health Protection Agency North West has advised anyone finding a sick bat to contact the Bat Conservation Trust. Hospital A&E units, microbiologists and infectious disease consultants across the North West were informed about the incident. It is only the fourth time European Bat Lyssavirus type -2 (EBLV2), which is a strain of rabies, has been discovered in bats in the UK - all were Daubenton's bats. Dr Ken Lamden, a consultant with the Cumbria and Lancashire Health Protection Unit, said: "The bat had been stunned after flying into a tree and was picked up by a member of the public and also handled by three professional bat workers. "None were bitten or scratched but all were vaccinated against rabies as a precautionary measure and all are infection free." Daubenton's bats rarely roost in houses - preferring habitats near water - and the infection has not been found in the more common pipistrelle bat. A bat handler working in the Angus region of Scotland died from EBLV2 in November 2002 and is thought to have had contacts with many bats. "Although any risk to humans from a bat bite or scratch would be low, we would strongly advise members of the public not to handle a sick or injured bat," said Professor Martyn Regan, an epidemiologist with the North West Health Protection Agency. "Our advice is particularly aimed at anglers and walkers, as Daubenton's bats tend to live near rivers or canals, often roosting in the stonework of bridges. "Anglers should not handle bats that become snagged on their fishing lines." The Radcliffe incident will be discussed at an international conference on zoonoses - the transmission of infections from animals to humans - held at the Crown Plaza Hotel in Liverpool from Wednesday to Friday. More than 4,000 bats have been tested for rabies since 1986 and the three other positive cases were in Sussex in 1996, Lancashire in 2002 and Surrey in 2004.